The Parkside chapter of BNI have decided to do something funny for money this Red Nose Day. We meet every week and this week we will be wearing something ‘red’ to our business meeting to show our support to comic relief. 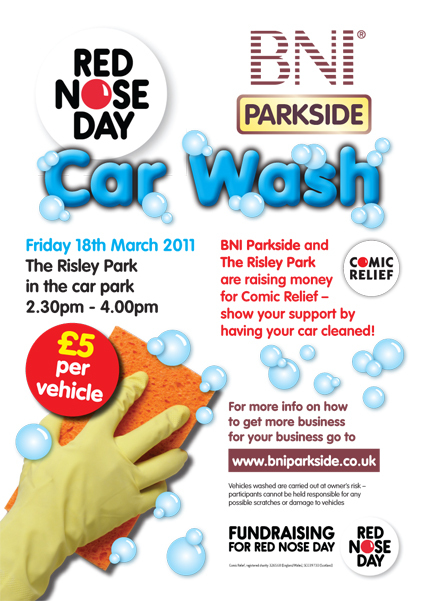 After our lunch meeting on Friday 18th March 2011 Team Parkside & staff from the Risley Park pub will be washing cars to raise some cash! Come along and get your vehicle washed between 230pm – 4pm for only £5, or just come along and have a giggle at us and throw some money in the bucket, or you can kindly make a donation here. Please support us as your cash really can make a huge difference to the lives of vulnerable people across the UK and Africa.